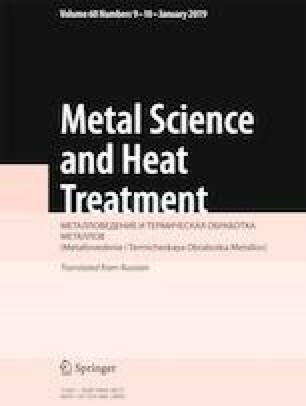 The effect of pre-recrystallization annealing on the evolution of the structural and phase state and the deformation and fracture behavior of ultrafine-grained titanium alloy VT16 obtained by pressing with change of the deformation axis and gradual lowering of the temperature within 1023 – 723 K is studied. It is shown that the process of pre-recrystallization annealing is accompanied by retrogression of the strained structure, which lowers the strength characteristics, and by a β → α phase transformation and redistribution of the alloying elements, which keep the strength properties at a high level. Translated from Metallovedenie i Termicheskaya Obrabotka Metallov, No. 9, pp. 28 – 36, September, 2018. The work has been performed with the help of the equipment of the “NANOTEKh” Collective Use Center of the Institute of Strength Physics and Materials Science of the Siberian Branch of the Russian Academy of Sciences within the program for basic research for state academies of sciences for 2013 – 2020.